In this week’s (spot)Light, Christian talks about his family, his role and how he got started in the field. Seattle City Light repair crews are responding to reports of power outages across the City Light service area. As of 5 p.m. on Nov. 13, 2017, about 51,000 customers are affected from Mountlake Terrace to Burien. City Light has readied extra crews and resources in order to respond to outages this evening, and power will be restored to everyone in our service area as quickly as safely possible. If you are experiencing an outage, visit the Seattle City Light Outage Map to get updates on restoration work. You can also follow City Light’s Twitter and Facebook accounts to get updates on outages. If your outage is not on the map, you may report it by calling (206) 684-3000. With the severe damage recently caused to the spillway feature of California’s Oroville dam, which forced 188,000 people to evacuate, we spoke with Chief Dam Safety Engineer Kim Pate, who shared insight on City Light dams, their structures and emergency protocols. Can you explain what happened with Oroville? The best way to get up to date information from Oroville is to refer to the California Department of Water Resources web site at http://www.water.ca.gov/. California Governor Brown is providing updates and transparency to this incident and assessment. How are City Light dams different/similar to Oroville? Every dam is different. There are some generalities, but every dam is different in how they operate and how they’re constructed. Most City of Seattle dams are concrete, except for South Fork Tolt which is an earthen embankment dam like Oroville, though the Tolt is about a third of the size and height. The issues with embankment dams are different than concrete which means we look at different information; not necessarily more or less significant, just different areas to watch. Tolt also has a different type of spillway—a Morning Glory—which is a big round piece of concrete situated in the reservoir upstream of the dam and not on the face of the dam. When in service, the water pours in like a drain and comes through the concrete channel. The other difference is that our dams don’t have anything like Oroville’s emergency spillway. We can’t rely on something like that, so we must keep a close eye which means our equipment is well-maintained. In fact, our Morning Glory spillway is going through a rehabilitation this summer just to improve the hydraulics of its lifting and lowering. It’s fine now, but it’s a step to ensure we’re increasing the reliability of our equipment. We have numerous individual inspections at our projects, and in fact our City crew walks the project daily for a visual inspection. What procedures does City Light have in place in case of a situation like this? We have established a comprehensive Emergency Action Planning (EAP) process in concert with our regulators. This includes an annual process review and exercises to test the functionality of the program. It’s important that people know that monitoring our dams is a daily routine. Our staff is constantly around these dams. If there’s any subtle changes—doesn’t have to be major—we’re actively looking from a civil, mechanical, electrical, operational point of view. The important thing with an EAP is that it’s not just City staff who can activate it. If anyone sees something unusual they have the power to activate the EAP by contacting their emergency management agency, their local sheriff’s department or even their Mayor’s office. We also have annual meetings with the city of Carnation (located near Tolt) which is built around our emergency action plan. It’s a time where residents can ask us anything they want. We work closely with them. We even have an emergency siren that goes off once a month to check on it. The schools, the city halls, the whole region is very engaged in understanding our Tolt project. For further information on City Light dams, consider a tour. Kim also suggests visiting FERC for up-to-date information about other projects and resources. Safety is our number one priority here at City Light, and our partnership with Take Winter By Storm demonstrates our commitment to both safety awareness and emergency preparedness. With the recent landslide in West Seattle, we wanted to share a few tips that can help prepare you for such an event and provide information on what to do in case of a power blackout. How does a Landslide occur? The USGS defines a landslide as “the movement of a mass of rock, debris, or earth down a slope.” A landslide can be triggered by earthquakes, volcanic activity, snowmelt, changes in water level, or in this case, heavy rainfall. The topography (and weather) of Washington State increases our susceptibility to these types of natural disasters so it’s important to be aware of its causes and to be prepared. If you know that your home or place of business lies in a potential landslide path, prepare, prepare, prepare! Power up: As seen in West Seattle, your power can go out in the event of a landslide. It’s important to have alternative forms of power on-hand. Whether it’s battery-operated, solar-powered, or crank up, a radio is a good emergency device to have. It will keep you connected to critical news and information until your power is restored. Flashlights and emergency light sticks are other useful tools that will keep your area lit. Have a plan: Devise a plan with those around you so you know what to do in case of an emergency. This will also ensure you have a headcount for those of whom you’re responsible. Emergency backpack: Never underestimate the *power* of an emergency supply. Stash yours with warm blankets, sweatshirts, water, and nutrient-filled snacks, to keep you warm and nourished until your power returns. This checklist by Take Winter by Storm provides more in-depth detail about what your emergency backpack should contain (including a first aid kit). Get weather ready: Winter is arguably Mother Nature’s harshest season. Be prepared with this detailed pamphlet from Take Winter by Storm, outlining necessary steps to get your home weather ready. Call 911: This should be the first thing you do. Authorities can best assess the situation, take the right steps to ensure safety, provide orders of evacuations, and aid to injured parties. In case of a blackout: Report any power outages to our hotline at 206-684-3000. Want to know the status of an outage and the area affected? Check out our power outage map or follow us on Twitter (@SEACityLight) or Facebook for updates. Don’t go near any fallen power lines or wires, and don’t try to fix your electricity. Know that Seattle City Light crews are working hard and fast to get your power restored. Be alert: This applies for all activity, but is especially important when driving. Roads are often affected by landslides so watch for collapsed pavement, mud, fallen rocks and other signs of fallen debris. Should you come across a fallen power line, keep a safe distance and report it to 206-684-3000. Sound matters: Pay close attention for any unusual noise (e.g. trees cracking, rocks tumbling) that can indicate moving debris. For more safety tips and information, visit takewinterbystorm.org. For updates on power outages and more, follow Seattle City Light on Twitter at @SEACityLight, on Facebook at or visit our website at http://www.seattle.gov/light/. Seattle City Light recently completed the final phase of work in the Holly Park neighborhood to upgrade the streetlight electrical grounding system. This work ensures that all streetlights continue to work properly and safely by reducing the risk of contact voltage through improved grounding. 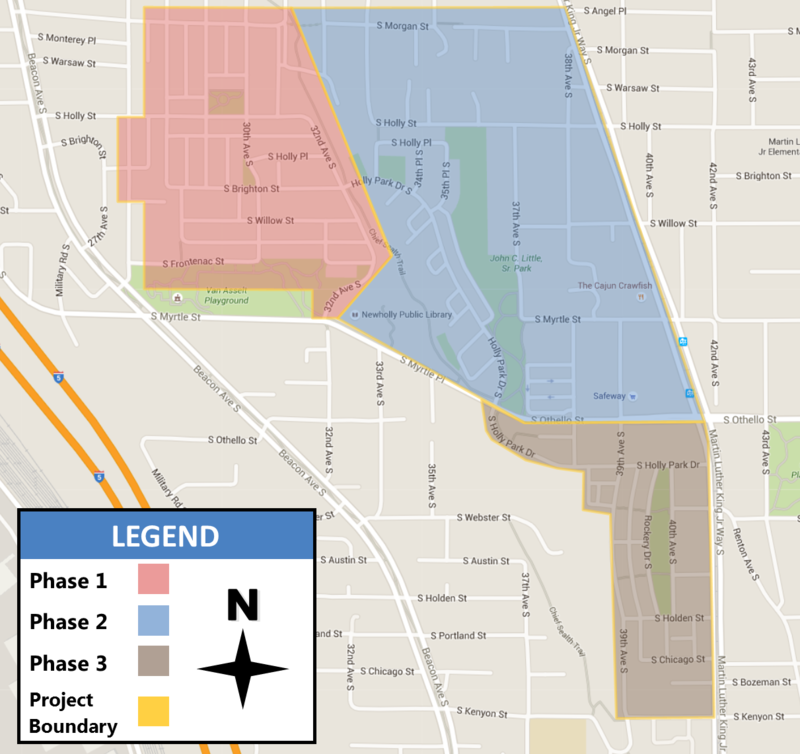 A map outlining the phases of work in Holly Park. Grounding is installed on electrical systems to ensure safety for anyone who may come in contact with elements of the system. Contact voltage can occur on metal streetlight structures, or other equipment that can conduct electricity and become energized. No contact voltage problems have been found at Holly Park during the past three years of inspections. Testing is completed annually to make sure all electrical equipment is safe. Contracted crews completed the final phase of this project in October 2016. As safety for customers is Seattle City Light’s first priority, the utility will continue to test all metal streetlights and associated structures in its service territory for contact voltage annually and report on the findings.